A colorful, albeit a bit light, source for women’s history is the collection of letters written home by Mary Boardman Crowninshield (1778-1840), the wife of Benjamin Crowninshield, a congressman and Secretary of the Navy under Presidents Madison and Monroe. On the surface, Mary’s and Benjamin’s marriage looks like a typical Salem mercantile merger, but not so typical was her decision (or maybe it was their decision) to accompany her husband to Washington in the fall of 1815. The letters describing their trip, by carriage and steamship, and residence in Washington over the next few months were published by Mrs. Crowninshield’s great-grandson, Francis Boardman Crowninshield, in 1905, and they yield some interesting insights into the Washington social scene in the immediate aftermath of the British occupation of the city and burning of the White House in general, and what everyone was wearing (most prominently First Lady Dolley Madison) in particular. Mrs. Crowninshield was clearly an observant and detail-oriented woman, but her lengthy descriptions of the dress of the women whom she encountered really stand out in comparison with her briefer assessments of events or her surroundings. Almost as soon as she arrives in Washington, she calls on Mrs. Madison in the Octagon House, where she takes note of the blue damask curtains and finds the First Lady dressed in a white cambric gown, buttoned all the way up in front, a little strip of work along the button-holes, but ruffled around the bottom. A peach-bloom-colored silk scarf with a rich border over her shoulders by her sleeves. She had on a spencer of satin in the same color, and likewise a turban of velour gauze, all of peach bloom. She looked very well indeed. You can’t expect Mrs. Crowninshield to get excited about the architecture: she hailed from Samuel McIntire’s Salem! But one would like to see some mention of the rebuilding of Washington, the slaves who lived in the Octagon House along with the Madisons, maybe a bit of politics: but no, it’s really all about who wore what where and when. Historical artist Peter Waddell’s depiction of the Octagon House in Washington, Mary Boardman’s childhood home on Salem Common, and the Salem house of the Crowninshields, where they entertained President Monroe in 1817, now the Brookhouse Home for Aged Women. Well, if that’s what she wants to write about let’s go with it; these are her letters after all! She seems to be almost as impressed with the dresses of Mrs. Monroe as Mrs. Madison: the former is “very elegant”, dressed in “very fine muslin lined with pink” on one occasion and “sky-blue striped velvet” on another, both times with velvet turbans embellished with feathers. Mrs. Crowninshield clearly is intimidated/impressed by all these velvet turbans in Washington: she has insufficient velvet and no feathers at all, and as they are very dear she combs her braided hair as high up as possible and weaves in flowers and ornaments—including a golden butterfly which Mrs. Madison actually admires. There is great concern about trim: Mrs. Crowninshield orders some very nice dresses from a Washington mantua-maker but implores her mother to send some red velvet trim from Salem along with Judge Story—–a Supreme Court Justice—when he makes his way back to Washington! And he does. This seems like the most insightful detail of Mrs. Crowninshield’s letters: imagine a Supreme Court Justice as a clothing courier! Peter Waddell’s recreation of one of Dolley Madison’s “Wednesday Squeezes” with many turbans and feathers in evidence, White House Historical Association; the capture and burning of Washington in 1814, New York Historical Society. Mrs. Madison continued to be an active hostess in her temporary quarters, which Mrs. Crowninshield tells us all about, but she does not have much to say about the post-war state of Washington. But back to Dolley Madison, of whom Mrs. Crowninshield has the most to say, as she attended several events over the holidays in December of 1815 and January of 1816 hosted by the First Lady. Mrs. Crowninshield admires everything about Dolley—her demeanor, her apparent kindness, her ability to converse with ease—but above all, her clothes. Either Dolley rescued her famous wardrobe from the burning White House along with George Washington’s portrait or she replenished it with purpose. At a New Year’s Day reception, Mrs. Madison was dressed in a yellow satin embroidered all over with sprigs of butterflies, not two alike in the dress; a narrow border in all colors; made high in the neck; a little cape, long sleeves, and a white bonnet with feathers. That’s quite a close observation. At a Wednesday night levee, Mrs. Madison was adorned in muslin dotted in silver over blue and a beautiful blue turban with feathers. Mrs. Crowninshield noted that I have never seen her look so well and was clearly very pleased that Dolley had remarked that they “thought alike”, as she was dressed in blue as well. The last description of Dolley’s dress refers to a more elaborate dinner party, in which she was dressed in black velvet trimmed with gold [and] a worked lace turban in gold with a lace and gold kind of thing over her shoulders and looked “brilliant” in Mrs. Crowninshield’s worshipful estimation. Not long after this event, Mary Crowninshield returned to Salem, where the Reverend Bentley seems to have visited her immediately, in search of all the Washington gossip as well as her opinions of both the President and the First Lady. In her last letter, to her husband who remained in the capitol, she admits that I think I never shall want to go from home again. Dolley Madison’s yellow silk “butterfly gown (s)” ? at the Smithsonian: the First Ladies Hall and a 1934 Curt Teich postcard. I hate tumblr. I link my posts to it, because it is automatic and they display beautifully, but I never go there. I know that pretty much all I will find is lifted: unsourced, uncredited, without any context whatsoever. Of course, the internet is an anarchical wild west, but tumblr is still the worst outlaw: thoroughly unaccountable. It’s clearly cool not to credit on tumblr, so I know that if I go there I will be very, very annoyed: I might find a beautiful picture, but I will never, never find its source. The other day I was searching for some more information about someone who lived in my house 150 years ago: Willard Peele Phillips. I check up on him occasionally, because he was a pretty active entrepreneur and abolitionist and new sources are digitized all the time. I wound up on tumblr, where I found a very familiar photograph, and some very, very familiar text on a blog entitled The Civil War Parlor, whose author claims that “every effort is taken to remember the men and women of the Union and Confederacy equally with dignity and respect”. Below is the picture, lifted and lightened from my post Remembering the 54th Regiment. Instead of copying my accreditation, she copies my text above, almost word for word. “Her” text is first (in red!) followed by my original words, in bold. Three little known Salem men with the 54th Massachusetts Volunteer Regiment: Willard Peele Phillips, a prominent Salem businessman served on Governor Andrew’s recruiting committee for the regiment, Luis Fenollosa Emilio was a young captain in the Regiment, and later served as acting commander after he became the only officer to survive Fort Wagner, and Francis H. Fletcher, a clerk in a Salem printing office, enlisted in the Regiment and fought until the end of the war. Those are the bare facts, but the involvement of these three men runs deeper. Phillips raised money, not only men, for the Regiment, Emilio later became the historian of the Regiment with the 1891 publication of The Brave Black Regiment. The History of the 54th Massachusetts, 1863-65, and Fletcher protested the army’s unequal (or nonexistent!) pay system while still in service. Less well-known, in varying degrees, is the involvement of three Salem men with the 54th Massachusetts Volunteer Regiment: Willard Peele Phillips, a prominent Salem businessman (who happened to live in my house at the time, or I live in his now) served on Governor Andrew’s recruiting committee for the regiment, Luis Fenollosa Emilio was a young captain in the Regiment, and later served as acting commander after he became the only officer to survive Fort Wagner, and Francis H. Fletcher, a clerk in a Salem printing office, enlisted in the Regiment and fought until the end of the war. Those are the bare facts, but the involvement of these three men runs deeper. Phillips raised money, not only men, for the Regiment, Emilio later became the historian of the Regiment with the 1891 publication of The Brave Black Regiment. The History of the 54th Massachusetts, 1863-65, and Fletcher protested the army’s unequal (or nonexistent!) pay system while still in service. She not only left out the all-important first line (does this woman not know how to cut and paste?) and Francis Fletcher’s letter, but linked this text to the picture without my accreditation: Capts. Tomlinson and Emilio (center) with Lt. Speer, all of Company C of the Massachusetts 54th, May 1863, Library of Congress, Letter of Francis H. Fletcher to Jacob C. Safford, Gilder Lehrman Institute of American History. Consequently Captain Emilio, in the center, is the only proper identification in this picture: his fellow officers, Capt. Tomlinson on his right and Lieutenant Speer on his left, are literally left out of the picture by Miss Civil War Parlor, who, let me remind you, is dedicated to taking every effort to remember the men and women of the Union and Confederacy”. 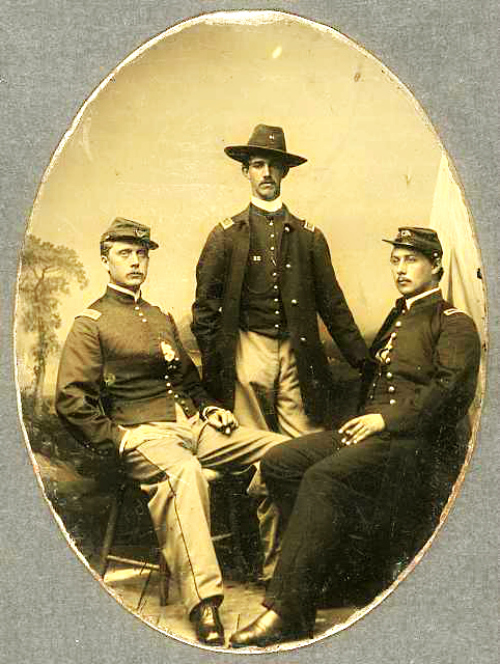 AGAIN: Unknown Photographer, Second Lieutenant Ezekiel G. Tomlinson, Captain Luis F. Emilio, and Second Lieutenant Daniel Spear, October 12, 1863, tintype, 3 1/4 x 2 7/16 in. (8.6 x 6.5 cm. ), Library of Congress, Prints and Photographs Division. All three survived the War, but only Emilio was from Salem: Tomlinson was from Radnor, Pennsylvania, and Spear was from Boston.